US, 2007, 93 minutes, Colour. Steven Pasquale, Reiko Aylesworth, John Ortiz, Johnny Lewis, Robert Joy. Directed by Colin and Greg Strause. Aliens – bad. Predators – good. Victims – humans. In Alien versus Predator in 2004, film-makers drew on the popular series of Alien films as well as the less distinguished Predator films. The two strange monstrous groups engaged in battle in the Antarctic with collateral damage for humans. 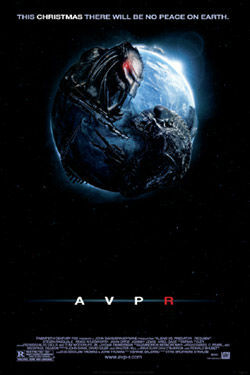 This special effects dominated sequel re-runs the same basic plot except that the attack is in Colorado and (with the help of the IMDb synopsis outline rather than the confusing film itself much of which occurs in the dark) aliens come to earth, destroy all but one predator who then tries to turn the table on the aliens who are infiltrating humans, killing them off as well as doing multiple repeats of that famous scene in the original Alien where the monster emerges from John Hurt’s stomach. There is a group of less than interesting humans along with a poor sheriff who is trying to make sense of what is happening. But, this is one of those films where nice people (and children and a pregnant mother) are attacked by the aliens not just the nasty characters. Lots of special effects (this has been the previous career of the two brother directors), some shock editing and a rousing highly orchestrated score. It is really only for those obsessed with this kind of science fiction. 1.The popularity of Alien and its series? Predator and its series? Capitalising on the classics and making B-budget action adventures fro the 21st century? 2.The importance of the special effects, space, the spacecraft, the makeup and design of the aliens, of the predators? The crashes? The confrontations with the aliens, deaths? Blood and gore? 3.The intended audience for this kind of film? B-budget? Poor acting? Plotting? The importance of the confrontations and special effects? 4.The Colorado setting, the town, the outskirts, the woods? Authentic? The contrast with outer space? The world, spacecraft? The musical score? 5.The human characters: Dallas and his return home, his past, his relationship with Ricky, Ricky and his studies, in love with Jesse, working at the pizza place, his relationship with his brother? Jesse and her teaming up with the group, their bashing Ricky? The role of Sheriff Morales, his keeping order in the town? Kelly and her husband, the child? Her return from military service? 6.The aliens coming to Earth, transforming, the death of the father and son in the woods? Their further killings? The confrontation with the wife of the policeman, his death? Her death? The pregnant woman in the hospital? 7.The aliens, the makeup, their hostility? The destruction of the predators? 8.The predators, the makeup, the attack from the aliens, the survivor, becoming invisible, reappearing? The fight with the aliens? 9.The humans, the hospital, the car? The popular ingredients for this kind of group of survivors? The menace? 10.Colonel Stevens, the military, the National Guard coming in, the destruction? 11.The final confrontations between alien and predator? The special effects? 12.The value of this kind of film – the old-style B-budget films of the 50s given a 21st century makeover?